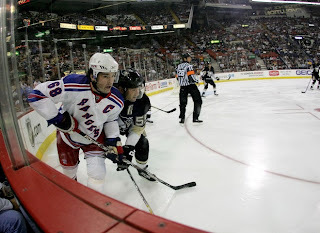 As Jamomir Jagr was quoted last night after another loss to the New York Rangers, courtesy of the Pittsburgh Penguins. The Rangers are now 2-5-1. The Rangers have gone 181 minutes, 9 seconds without scoring an even-strength goal. The Rangers haven't scored so few goals in their first eight games since they had nine in 1950. NYR goalkeeper, "The King" Henrik Lundquist was incredible, the little-Rangers (Callahan, Girardi, Prucha) played hard and the veterans played an ineffective perimeter game as to avoid any contact near the opposing net. This game is not working. Many of us are not prepared to blame any individual player, but it is leaning toward our great Captain Jagr, whose European style finesse game is not working for the once-gritty game play of current Rangers Brendan Shanahan, Scott Gomez and Chris Drury. The system designed around Jagr needs to change. If it doesn't, the coaching needs to change. Hey Jags, we still believe! Please just don"t wait until December to realize it! UPDATE: Blueshirt Bulletin has a post that outlines outrageous stats for our Blueshirts to date. Great reading. Sad realities. Go here. Agreed. Couldnt say it better myself. BTW, where do you get your photos? Here and there on the net. Google Images and put the date of the game in the search engine. Simple. Great shots, usually high quality pics 30 minutes after game ending. 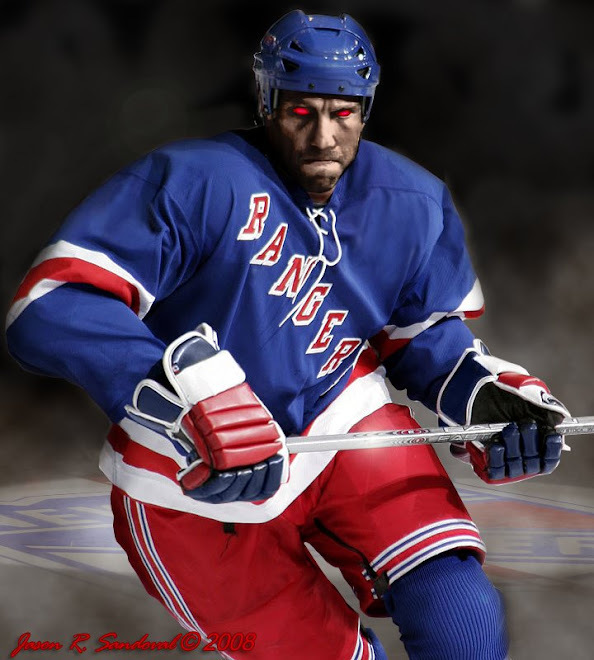 A little foreshadowing, maybe we'll be exchanging nice pictures this season as opposed to great Ranger hockey moments. Ouch, Not such a good start for the Blueshirts huh? Hopoefully, for your sake, Jagr has more than just believing to help your team back on track. I wish Gomez was actually making an impression going into tonight's game at MSG, but he will fizzle - I suspect - as he has since opening night. jags will pull it out, he's just being lazy right now.